I quietly slip into John’s room, checking him one last time before tucking my own weary body in bed for the night. I look at my boy, curled up on his floor mattress, bed rails in place, and he looks so… small. Another special needs mom (it’s a handy way to refer to myself and those in this tribe) once remarked that the closest she came to envisioning her daughter healed and whole, as she will be one day in heaven, was when she observed her while she slept. It is very true. High and low muscle tone no longer visible. Limbs not as contorted. Hands and feet at rest. All manner of moaning and sounds hushed. Rhythmically breathing in and out. Lying down as anyone does while sleeping. I love to steal glimpses of my sons while they sleep peacefully –almost as much as their Daddy does. There is something magical about it. 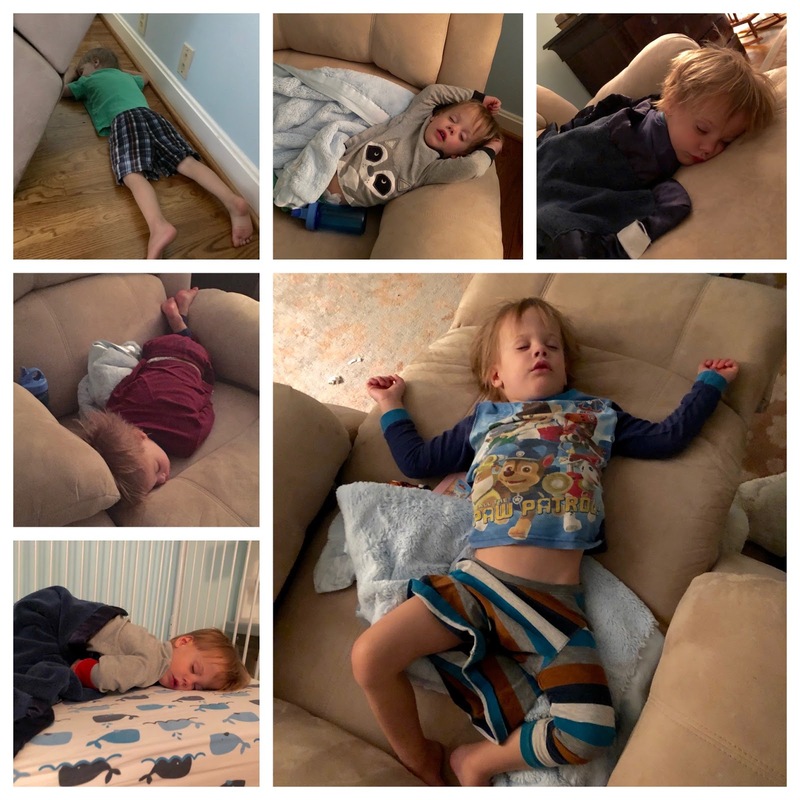 I have countless pictures of them in this state (and I usuallyremember to turn the sound and flash off of my phone). Sometimes their positions make us howl with laughter. Other times the simple breathing brings such relief as the panic can rise in my chest as I approach their beds. Some slumbering scenes are so beautiful that they simply take my breath away, in the best kind of way. These pictures of Michael are definitely the "howling" category. This child DOES have a bed... I include the bottom left photo for proof. However he much prefers this old lazy boy (or the floor behind it!) from "The Dump" - the same chair I lounged in 12 hours per day while on bed rest for almost 6 months with the twins. Oh, and he definitely took off his pj pants in the main photo and put this shirt on his legs instead. Ha! Sometimes, it is not so easy to encounter the Sacred or get these glimpses of heaven on earth. Monday night, John just looked small. Fragile, vulnerable, exposed. And he is small. 39 pounds at 9.5 years old. I feel like he has been 39 pounds forever. In that moment, all I could see was John’s disability, all I could feel was sad, and all I could think was, Why? That futile question that continuously pops into all of our minds more often than we would like. Oddly enough, the haunting question that makes us doubt both God and ourselves is also the mystery that pushes us to lean in a little closer, to look a little deeper. Logically, I know why. I know the head and church answers. We live in a broken world. All is not made new just yet. God has greater purposes that we cannot always understand and may not ever understand this side of heaven. He is weaving that frequently referenced "tapestry," and we only see that backside, a mess of tangled yarn. But emotionally…. and on that gut human level… I will never know why. Why some get to live “full” lives and others do not. Thinking and speaking people assert, “Who’s to say what a full life is?” You mean well, and I hear you. And yet no one can hear my child. What would he say? People claim he has a full life. Would he claim that too? When Stephen Hawking died earlier this year, people railed against Gal Gadot’s innocent tweet tribute in which she thanked Dr. Hawking and stated that he was now “free of any physical constraints.” She intended no harm, and I certainly do not believe she was outing herself as an “ableist.” (An ableist is someone who discriminates against individuals with disabilities.) Many with disabilities spoke out with sharp disapproval of Gadot’s remarks. 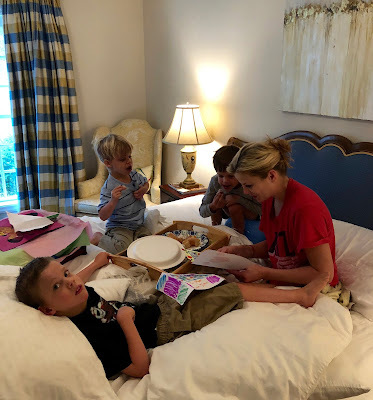 And yet, as a mother of a significantly disabled son, I had to take note of the fact that those who spoke out are just that – those who could speak out. They are the ones who have the cognitive abilities and at least enough technological abilities to speak or to type out. I had to throw my hands up in the air – what is wrong with wanting people in wheelchairs/with ALS/with communication devices to be “free”? What is so bad about wishing life could be a little easier for those we love and respect, and even for those we don't? For wanting those who do not have a voice to have one? Political views aside, isn’t that what the cry for separated children is about? I am neither discounting how God can use wheelchairs nor how much good can come from disability. Additionally, I acknowledge how many men and women with disabilities and diseases come to a place where they wouldn’t trade that chair, that pump, that tank or that therapy. I applaud these brave souls; to God be the glory! Disability can be a powerful, redemptive platform. Again, I know why. And yet I do not know why. 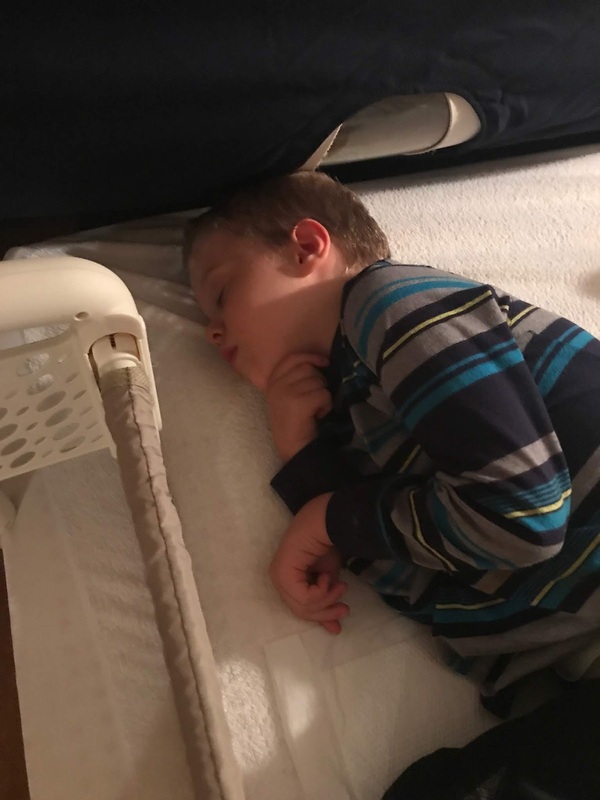 I behold my sleeping son on a random Monday night, desperately wanting to give him a voice – to hear his voice. I tire of putting on the brave, happy front as I wheel my child through a crowd, as I field genuine questions from confused children, as I contemplate the juxtaposition of attending an exhilarating conference at Princeton one week and then a laborious (and mainly just depressing) training on augmentative communication the next. And “oh yes, we are so grateful for John’s first power chair, and what a gift to have his communication device (going on 6 years)!” And oh yes, it is also… horrible. A power chair doesn’t come with the knowledge, skills, and dexterity to operate it. Similarly, a communication device does not provide instantaneous, clear communication. And by the way, it broke down again this week. Where is this oh-so-wonderful, digital voice when it has to be sent off for who knows how long to be repaired once more? And so it goes. We carry broken hearts, and we carry our son. As best we can, we attempt to help him put his best foot forward and to shield him from the weight of our sadness and from the broken interactions he encounters. Our story is not wrapped up with a bow. What's more, we are not in the final act. But in this pilgrim journey, Jesus gives me a voice. He is comfortable with my sadness. After all, his heart broke first. We weep, we sow, we cling to His promise (Psalm 126). I finished this blog post yesterday and then received the sweetest gift from the Lord this morning and captured it on video. (Click HERE and scroll down to watch video if you're reading this via email blast.) I had to share! This is brand new.... John is doing a crunch (his shoulders are off the ground although it is hard to tell) while "peddling" with his legs; the alternating of the legs is HUGE!